Natural rainwater can give your house or garden plants a boost. Use for cleaning or laundry, or filter for drinking. It's too valuable to let it run away unused. Just a Question: what happens to the rain barrel technology when things ice up in the winter time? Do most people just remove them and let the spout hang open? I have four of these on my downspouts. They are made to use with rain barrels. When my rain barrel is empty, I open this diverter. When it is full or when we are having a long term storm and I know my rain barrel will fill quickly, I close it. Any rain water at that time will divert down the rest of downspout to the ground as usual. 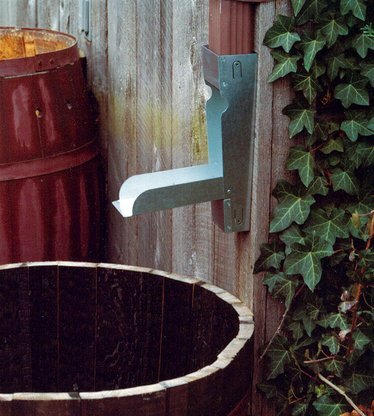 It is a very cleaver design when installed and inserted above rain barrel on the downspout. The photo of this product is misleading -the downspout should be connected to the bottom of the rain catcher too. We spliced this rain catcher into our gutter to use with a rain barrel. We open the spout to gather rain, and when the barrel is full, we shut the rain catcher spout and the rain goes down the gutter as it normally would. The only drawback we've found is if it really rains hard, depending on the design of the rain barrel, the barrel can't gather the water fast enough and it runs off the top of the barrel next to the house. Also, you have to keep an eye on the barrel and run outside (sometimes in the rain) to close the spout or the rain barrel overflows next to the house. Using this product requires checking it regularly, but it does work. In talking to friends with rain barrels, so far this is the best item we've found to get the rain in the barrels and be able to go back to the normal gutter system easily. We have been looking for a product that would help us harness rainwater from house roof into rainbarrel and thought this was it. In reality, it is not practical. Too bad the inventor did not design it as a downspout INSERT instead of an END ATTACHMENT. Letting the water deposit itself near the foundation when the spout is not in use, is not a good idea in most applications. I hope there is a redesign of this product.